Specialists for the baby boomer generation. With all clients, we have expert equity advisors available to discuss all equity release plans. Our advice can be given over the phone, face-to-face or through email, whatever is most suitable for you. Want to find out how much you can claim through equity release? Click Find Out More Now! Essex Equity Release provide unbiased equity release advice throughout Essex. Based in Benfleet, with Interview Suites in Basildon, Billericay, Brentwood, Burnham on Crouch, Chelmsford, Romford, Southend & Epping. Established in 1995, we have been in the vanguard of Equity Release Advice since 1999. The Essex Equity Release Advice Centre (EERAC) is a Division of OneCall Financial Advice Centre, specialising in the needs and concerns of the Baby Boomer Generation. As a family-run business, we attract 90% of new business from our existing clients and their recommendations to friends and family members. We invite you to browse our ever-expanding testimonials, which attest to the quality of equity release assistance we have provided to countless clients. Over a million people in the UK have taken out Pre Paid Funeral Plans, and over 300,000 have done so with Golden Charter. Essex Equity Release Advice Centre has access to a Panel of Insurers who can provide cover Top Quality Home Insurance. Life Cover for those in Later Life. Essex Equity Release Advice Centre has access to all the Major Providers, & can advise on either Term or Whole of Life Assurance. 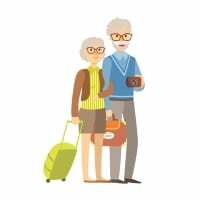 Travel insurance for Over 65's. In Later Life, the more likely our ailments are likely to strike, & the peace of mind knowing you are covered in the event of a health related issue. For expert independent home equity release advice please contact our specialists. Simply use our contact form to contact us FREE, or ring 01268 799211. Based in Benfleet, with Interview Suites in Basildon, Billericay, Brentwood, Burnham on Crouch, Chelmsford, Romford, Southend & Epping. I have worked along side Ron Radway for many years. He has a vast knowledge of the financial sector in particular in the area of Equity Release and Mortgages. I have referred many clients to Ron for advice over the years, and my saying to client's 'If Ron cant help you then nobody can' Ron is extremely professional and will always helps clients get through transactions stress free. 100% recommended. We have had dealings with Ron for a great many years and he always comes up trumps. Our recent dealing has been drawn to a speedy and satisfactory conclusion and he has kept us informed all the time in his usual cheerful manner as to how things are developing. Would thoroughly recommend. I dealt with Ron for a number of years now and have always found him extremely professional. I would recommend Ron's services as he certainly wants what is best for his clients. We had wonderful guidance and support from Ron enabling us to make the right decisions around Equity Release. What we also appreciate is that Ron continues to maintain contact so that we feel able to ask for advice on any issues around our finances. Essex equity were polite and they did everything for us they knew exactly what they were and i recommend them anybody i have recently have recommended someone to them and very happy what they did for. Ron Radway has the rare quality of being both extremely competent at what he does, and manages to do it in a friendly way. He will ALWAYS do his best to satisfy even the most demanding of financial requests. I have used his services and taken his advice for more than 20 years and would recommend him to anyone. Ron provides excellent advice guidance and support from start to finish. I was having difficulty getting Equity release on my property until I came across Ron Radway @ OneCall. Ron went the extra mile to find a lender, and PROBLEM SOLVED. I would recommend him to anyone, Ron is one of a kind, a TRUE gent. Ron is truly one of a kind, he is extremely knowledgeable and gives totally unbiased - impartial advice. I would't hesitate in recommending Ron to anybody at all - so if you are looking for someone to release equity from your property... there really is no one better! I was delighted with the service I got from Ron. He is knowledgeable and resourceful. He managed what might have been a difficult case with ease and efficiency. Very pleased with it all. Thanks, Ron. Excellent professional service. We have used the company a few times now. Would highly recommend. I can not speak more highly of the service I received from Ron - Overcome every obstacle, was very professional and very experienced. I will be recommending Essex Equity Release to family and friends. I have had business dealings with Mr Radway for 15 years or more and wouldn't trust anyone else. He has the same goals as you and always cuts to the chase....like a dog with a bone he won't give up! I really cant recommend Mr Radway enough and have recommended him to lots of people......pick up the phone you won't be disappointed! Very professional and friendly, nothing is too much trouble. Would certainly recommend. Provides great advice and would highly recommend Ron to anyone! Ron & Jackie, are excellent communicators and always manage to get the relevant point across in a straight forward easy to understand way. The down to earth approach has certainly helped me to build a successful relationship with all of their team. Best Advice, clear evidence and a thorough follow up is what I have come to expect and rely on. I visited Essex Equity release Advice centre last year and was given excellent and very clear advice I thought from the fiinancial advisor on Equity releases and lifetime mortgages for myself. I went with and Equity Release and am more than happy with the outcome. Everything was explained to me in detail. Would recommend them. My grandad received an excellent service here and various equity release and home reversion options were explained to him in great detail. Obviously highly experienced financial consultants! If you need any advice on Equity Release then this is the place to call. Very professional yet friendly staff. I would definitely recommend them! This is what advice is all about-Highly recommended! Essex Equity Release Advice Centre worked hard to help and were friendly to boot.